160 Days ago, our dossier arrived in Ethiopia. If you’ve been following my blog for the last few months, you know we’ve had some real ups and downs while waiting on our referral. There are certainly some things that I wish had not happened, such as Ryan’s seizures and hospitalization, but all of these things have allowed me to focus on something else other than when our referral would arrive. Ryan has now been out of the hospital for 5 days which is a record for the last month. His agency reports that he hasn’t had any seizures, but is still having problems with his balance. We go to see his neurologist on Thursday and I’m hoping he’ll be able to tell us that this is a temporary problem that will improve after his medications are leveled out. Now that things are starting to settle down, I’m trying to focus on some things here at home. 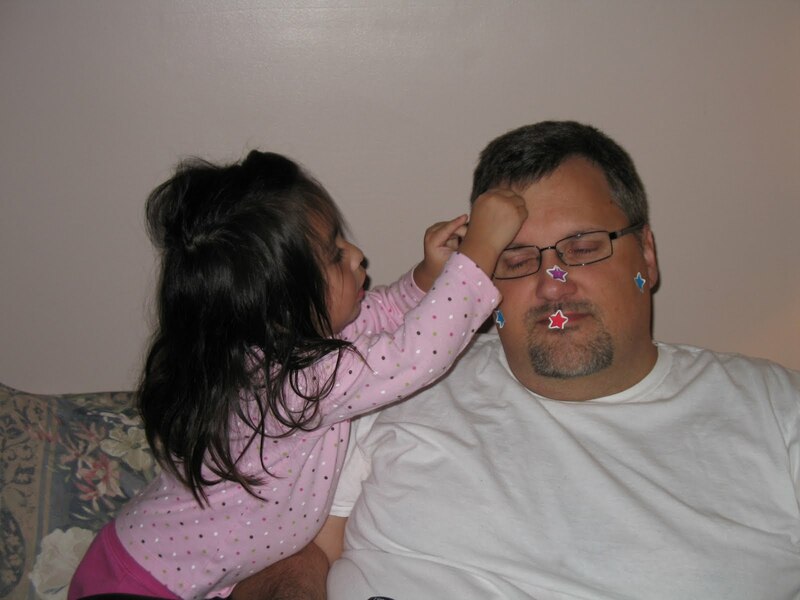 I didn’t get my fall cleaning done, so yesterday Lili and I began to tackle that chore. Yes, Lili actually did help a bit. She enjoys having her own rag for dusting and of course it’s always fun to see what treasures mom is going to pull out from under the bed or out of a closet. We have company coming for Thanksgiving again this year and it will soon be time to begin planning and preparing for our Thanksgiving meal. Christmas is approaching all to quickly again this year and Santa has just started on his list for the Weeks’ house. Last year was our first Christmas with Lili, but I can honestly say that I’m looking forward to this Christmas even more. There is just something very special about Christmas when viewed through the eyes of a child that has a better understanding of the holiday. And then next Christmas will be that much better having Lili and Naomi both here. 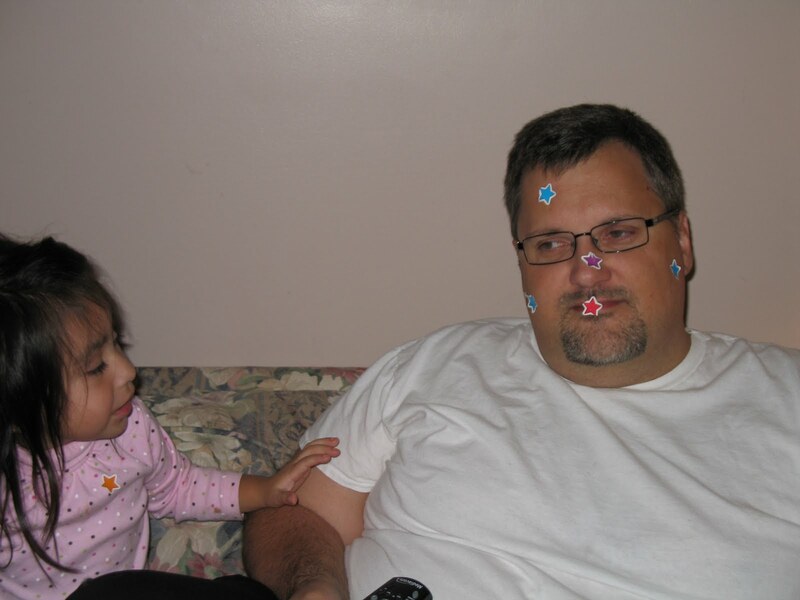 And now for no special reason, here are some pictures of Lili decorating daddy with stickers. We waited 164 days for our referral. I have to believe your referral is coming real soon!! 160 days! 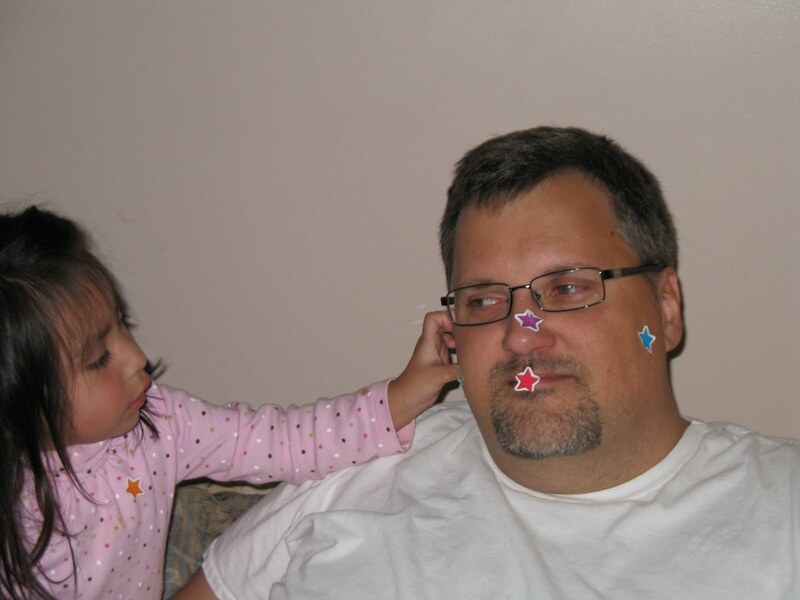 Wow that is amazing how time flies – I am on pins and needles for you 🙂 BTW…I love the face sticker pictures. Very cute! Enjoy your holiday preparations!